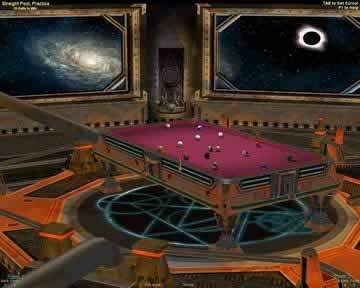 Live Billiards Game Review - Download and Play Free Version! Game play is easy. Simply left click to set your cue after you have lined up the shot, pull back the mouse toward you to set the power, then quickly move the mouse toward the screen to strike the cue ball. The balls roll just like in real pool and there are even help options to show you where the balls will roll. Additional features include English, en masse, ball jumping and so much more. Way cool! Live Billiards is an excellent pool game that lets you play pool games ranging from 8-ball to less common ones such as American and Rotation. A tutorial and practice mode that lets you undo shots, move balls, see recommended shots, and more makes this a game anyone can learn and enjoy. You can play against computer opponents on any one of nine different difficulty settings, or take on real people via a LAN or online. You even have the ability to customize the appearance of the pool table you play on. You start off the same as in many other pool games by selecting which type of game you want to play. There are some common ones such as 3-ball and 8-ball, as well as others like American and Pyramid. You then select whether you want to play against another player or the computer. If you choose to play against the computer, you can select a difficulty level for that opponent. You then can set how many matches someone needs to win (from a single match to many). After setting up the game, you begin playing with the rules of whatever type of game you picked. You play until you either quit or someone wins enough matches. When the game ends, you'll be able to select the options all over again and start a new game. There are a few modes in Live Billiards that affect how you play the game. The Tutorial teaches you everything you need to know to play pool and be successful. Additionally, you can play any type of game in a Practice Alone mode or Practice with Opponent mode. These modes give you some options to help make the game easier and give you a chance to improve your skills. For example, in the practice modes you can undo moves, move balls, see recommended shots, and turn on lines that show the path of the ball after you hit it. These features help you train and learn the games. There's also a Competition mode that lets you take on opponents without any sort of help. One positive aspect of the game is the large number of difficulty settings to choose from. When facing off against a computer opponent, you can select one of nine different difficulty levels. This allows you to better tune the opponent to your skill level, and play a game that provides a reasonable challenge. The controls in Live Billiards are fairly simple and straightforward. All controls can easily be referenced quickly a help menu in the game. You mainly use the mouse to aim and take shots. Other keys and controls let you adjust things such as music, the view, or the cue angle. The one issue when it comes to the controls is adjusting or controlling how powerful your shots are. You take shots by moving the mouse backwards and then forwards to hit the ball. However, this method means that it's difficulty to fine tune how hard you're going to hit the ball. It would have been nice to have some sort of alternative to make it easier to take weaker/low power shots. Another positive aspect of the game is the presentation. The graphics are well done and similar to other pool games. 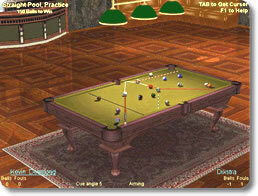 You can customize some of the appearances, such as changing the type of pool table as well as its color. You can also change the room the pool table is in. The tables themselves are also very detailed, and you can see realistic details like coin slots on the side of the table. The audio is another great part of the game. Not only do you hear the normal sounds of pool, but the game includes music as well. While there is only a single song in the game, you can add your own to a folder and play them back in the game. It's a nice addition that adds more customization and improves the feel of the game. 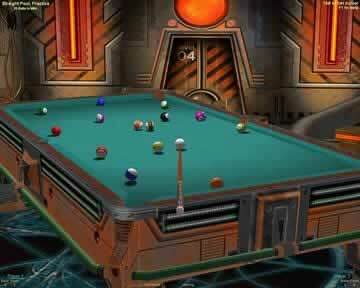 Overall, Live Billiards is an excellent pool game that's absolutely perfect for any fan of pool. The tutorial and practice modes make this a great game regardless of your skill level. You've got a large number of game types to add some variety and keep the game entertaining. You can take on computer opponents on a range of difficulty levels, or play against other people on a LAN or online. You can even customize the appearance of pool tables and the room you play in. There are some minor issues like the limited music included with the game or controlling your shot power, but they pale in comparison to the positives of the game. If you have any sort of interest in pool, don't hesitate to try this game.